Siemens Mobility will provide the traction power supply substations for the Matinkylä–Kivenlahti section of West Metro. The contract is valued at close to EUR 5 million. A consortium consisting of Siemens Mobility Oy and Electric Power Finland Oy will deliver the substations for traction power supply for the five metro stations and the Sammalvuori depot included in West Metro’s second phase. The substations will supply the electric traction power to the conductor rail of the rail line. “The delivery of the traction power supply substations is one of the 24 subcontracts that extend throughout the metro line. Each subcontract is important for the overall success of the project. 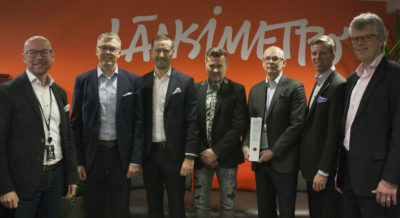 We are very happy to have an experienced implementer also for this contract,” says Raimo Kaunismäki, Technical Director at Länsimetro Oy. The first deliveries will start in May 2019. The contract is due to be completed by summer 2021. “The contract represents a successful continuation of West Metro’s first phase, for which Siemens also delivered the DC traction power supply substations. Siemens has a solid background and experience in traction power supply for rail traffic infrastructure,” says Jari Jokitöyrä, Sales Manager at Siemens Mobility Oy. West Metro’s second phase is estimated to reach completion in 2023. The excavation work was finished last year. The rail line and five stations have moved on to the construction phase, which is proceeding according to schedule. HVAC and electricity work is already ongoing at the Sammalvuori depot. Up until 2022, construction will continue at the stations and on the rail line after which we will move on to the commissioning phase, which includes the acceptance of contracts, a comprehensive testing phase and approvals by public authorities. Länsimetro Oy will have completed its task when the metro is handed over to the operator so that preparations for transit operations can begin.